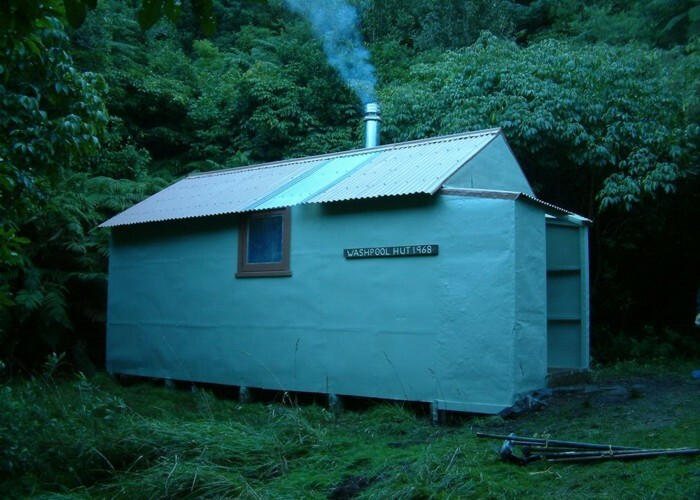 Washpool Hut is in the Haurangi (Aorangi) Range, near Cape Palliser. 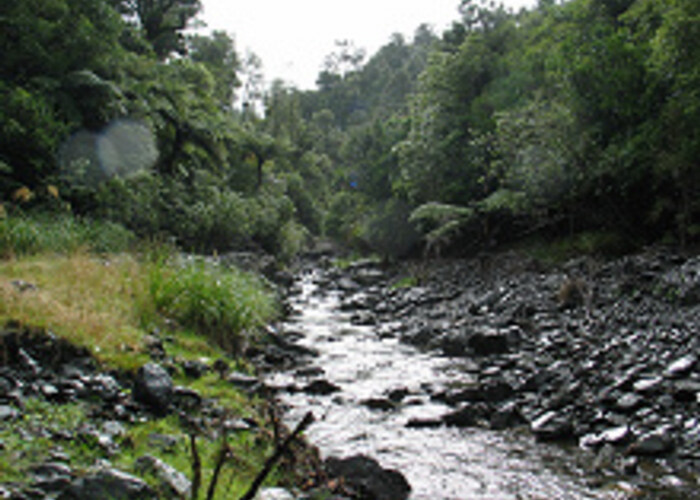 Because of its location, this range is relatively protected from bad weather, except in a southerly storm, which makes it a great bad weather destination for Wellington trampers. Washpool Hut,Aorangi FP • By OldGoat. Licence: C.
On a March weekend three of us decided to do some tramping near Wellington. As the weather report was not too promising, we decided not heading to the Tararuas, but instead opted for exploring the Haurangi Ranges, where none of us have been tramping before. 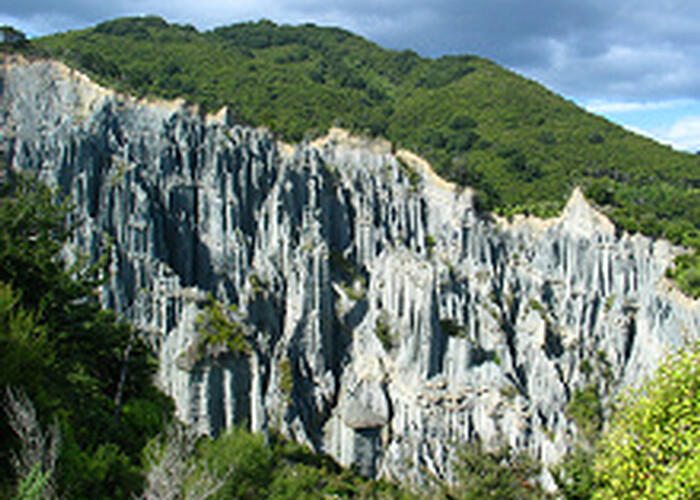 Putangirua Pinnacles • By donorkebab. After a rather late start and a crossing over the Rimutakas, we took the road to Cape Palliser and landed around 11.30 am at the car park at Te Kopi, near the Putangirua Pinnacles. According to the info from DOC, Washpool Hut was 4 to 5 hours away. The first challenge was to climb up to the Putangirua Pinnacles, a spectacular rock formation created by erosion of old layers of gravel. There are a multiple of tracks leading up to the Pinnacles. We took the "bush track", a well-formed track with proper steps, climbing steeply over the hillside, and providing great views over the Pinnacles. The alternative is to follow the river from the car park right up to the Pinnacles, then turn left to the lookout and to rejoin the bush track. After around 45 minutes we reached a 4WD track that leads from the village of Te Kopi to the ranges. A short flat section was followed by a modest climb up tp Point 475 on the map, and shortly after the 4WD track stopped and and turned into a proper tramping track, well-marked with the usual orange triangles. The track undulates for about an hour before reaching a steep climb up to 700 meter to the ridge of Mt Surf. Here the track takes a sharp bend and besides a small bump it is mostly downhill from here. We have seen a few beautiful kererus at this section of the track. The last section of the track is a very steep, approximately 1 km long descent to Washpool Hut, which we reached 5 hours after leaving the car park. The hut itself is rather basic, but it was clean. It has six bunks and a fireplace. At the moment there is no water tank, but Washpool Creek is 3 minutes away, so it is not a problem. Our sleep was only disturbed by the possums partying all night on the roof top. The next day we decided to follow Washpool Creek back to the road instead of retracing our steps to the Pinnacles (none of us was keen to climb back on the steep slope to the ridge). Apart from one tricky gorge, where we had to jump into a few waist-deep pools, it is moderately easy to negotiate the riverbed, although it is definitely not for those who don't want to wet their feet. The experience worth the effort though, for us, the river tramping was definitely the highlight of this tramp. Washpool Creek • By donorkebab. After about 2 to 3 hours of balancing on slippery rocks and soaking our boots, we finally emerged on a farmland, from where a 4WD track took us back to the Cape Palliser road in about an hour. One of us hitchhiked back to the Pinnacles car park to pick up the car, and we still had most of the afternoon to take a look at the rugged surroundings of the Cape Palliser lighthouse, the nearby seal colony, and to have a great meal at the Teahouse in Ngawi, a nearby fishing village. All in all, we have spent a really enjoyable two days in the Haurangis. Note: To walk across the farmland at the bottom of Washpool Creek, trampers should obtain authorisation from the landowner, Mr Donald McIlraith (06 307 7823). OldGoat The gorgy bit has a "track" around it on the true left....but its not for the faint hearted. monkeysh1ne I recall being exceedingly cold when I exited into the teeth of a strong southerly weather system - took about 30mins to get feeling back in frozen fingers to start car! a great trip though. recommend! Dan-E Thanks for an informative and entertaining article - thoroughly enjoyed reading it. Sounds like a worthwhile tramp for a weekend - worth considering the next time I'm in Wellington. Added 27 March 2005 by donorkebabdonorkebab. No revisions.